There are several definitions for what a social norm is. What I mean by Social norms, are the practices that express a community’s ethics or values. A social norm is a principle put into practice. Social norms are things like tipping. It’s not a law, but it’s socially unacceptable to not tip. It’s ungracious. Even if the service is bad it’s still not ok to withhold a tip. Tipping expresses a collective value. Social norms, in themselves are not a problem. Jesus didn’t rise up against the social norms of 1st century Judaism because they were wicked inthemselves. The problem is, communities elevate their practices to the level of principles and judge harshly any other group that does not follow the same practice. They make practices, principles. Liturgy is a good example. True Christian worship looks like this and anything else is heresy. Christian communities love their practices; their traditions, and easily love them more than God or people. We create artificial barriers between us and other groups by elevating our social norms above people. This is what Jesus challenged. In Jesus’ day the purity laws, which were right and good in themselves, prevented the Jews from loving people who needed it. Instead it was a source of arrogance. Jesus challenged the social norms of all the various theological camps within the nation of Israel. He challenged the social norms that had become sacred cows among God’s people. Many of the social norms within 1st century Judaism weren’t unscriptural but became the source of self-righteousness that stifled outreach and became a stumbling block to many. How can this be? How can biblical truth ever be a problem? The social norms and convictions that we hold to, even if they are perfectly aligned with biblical truth, are meaningless if we hold them with dour, loveless, self-righteous arrogance. Because we think we understand the Bible’s teaching we think it’s our job to instruct everybody else. We think God reveals doctrines to us because he needed to put them somewhere safe and you’re now the keeper of the true flame. Your view of economics, politics, ethics, liturgy, family planning and everything else becomes a sacred cow, no matter how theologically sound it is, if it prevents you from loving people with compassion, gentleness and understanding. Instead of holding to our doctrines with personal conviction we easily and readily become tyrants. What I’m not saying is that you can’t have convictions or it’s wrong to share them. Luke 11:42 “But woe to you Pharisees! For you tithe mint and rue and every herb, and neglect justice and the love of God. These you ought to have done, without neglecting the others. 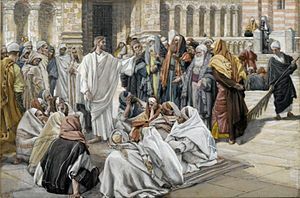 The Pharisees were tithing everything they received and Jesus said they shouldn’t neglect doing so but they had to remember the weightier matters of the law. Reformed guys act like the second greatest commandment is love your doctrines as yourself. Love people more than your doctrines. Love people more than your way of doing things. The call of the Apostles isn’t to make carbon copies of ourselves but to love our brothers and the stranger in our midst. Make sure you understand God is the law giver and God is the one who opens hearts and minds to understand. Let’s look at some examples. In Christian circles things like not drinking is a practice elevated to a principle. In reaction to the evils of drunkenness some denominations went the route of outlawing drinking all together. They make poorly constructed theological arguments for it but really it’s out of a desire to avoid drunkenness and its evils. Now, not drinking is a good way to avoid getting drunk, but too many Christians of this group, question the salvation of other Christians who do drink. They want to bind you with their conscience. But this is not an isolated problem. It’s not just them over there that do it. We have sacred cows. Homeschooling, homebirths, not eating MSG, vaccinations, having huge families, the gold standard, psalm-only singing and how you dress in church. These are all important issues but do we hold to what we believe with charity, compassion and humility? Our convictions too easily puff us up. Are your doctrines the source of your self-worth? Do you love your doctrines more than God and people? Do you laugh at those fools over there who don’t get it. Do you have compassion for them or pity them? Do you defend and hold your doctrines and traditions with shrillness or with mirth and kindness and joy? It’s like inviting someone over who doesn’t know the house rules. Say, in your house the social norm is to say please and thank you. Are you going to deny your guest the salt because he didn’t say “please?” Will he be banned from the table? But that’s different. How? If someone doesn’t know the house rules, they don’t know them. Whether it’s your house or our house here or the house of the universal church. Its like my kids. I too often get angry with them for things I think they should know already. Instead of meeting them where they are at, I judge them harshly for not understanding what I understand. We were brought to our current understanding by grace and its with grace we need to hold to that understanding. The world is watching us. Does the world see a compelling, attractive witness in our communities, in our fellowship? Do we act like our head Jesus, who endured all things, believed all things, hoped all things? Or does the world see a community obsessed with its own interpretations. Does it see an uncharitable group of people fighting for the head of the theological table? Does the world see us loving our doctrines so much we can barely say a civil word to or about other Christians? Do you patiently endure evil? Do you correct your opponents with gentleness? Are you quarrelsome when it comes to discussions of faith, politics, abortion, homosexuality and doctrine or are you joyful, compassionate, kind and meek? Jesus’ presentation of the truth was so compelling because He loved people so much. “Forgive them for they know not what they do,” he prayed on the cross. That is not our attitude when we see sin or what we perceive to be error. We hold our opinions too high. We hold our social norms over people’s head and judge them for not meeting our standard. Lay aside your pride. Ask God to humble your heart and quiet your mind. Don’t look for fault or the opportunity to pontificate or tell people how wrong they are. Going back to last week. Studying God’s word is a way to challenge our paradigms. To hold our lives up to His and measure whether we are loving our doctrines more than grace, more than God and people. We must quell our self-righteousness and look for an opportunity to love people. Overcome your social norms to love people.